At least 27 people have died in Portugal after parts of the country were ravaged by wildfires, state news agency Lusa says. 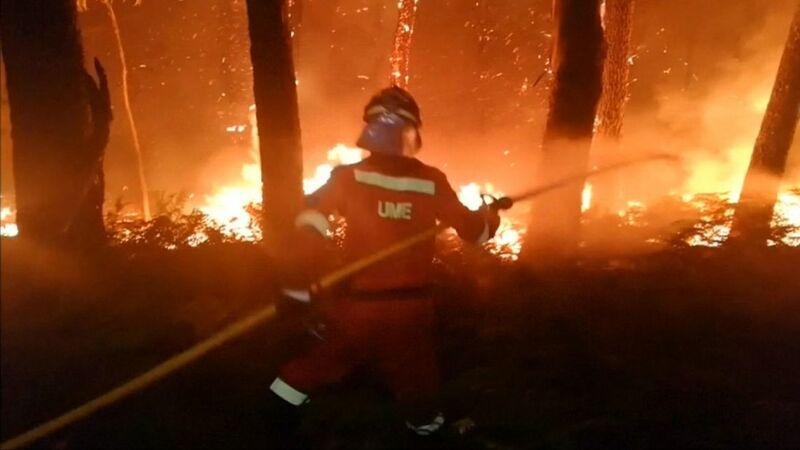 Hundreds of forest fires raged over the weekend in northern and central Portugal due to high temperatures and strong winds from Storm Ophelia in the Atlantic Ocean. Civil Protection officials say 145 blazes are still going and a state of emergency has been declared in all regions north of the Tagus river, an area roughly half of the entire country. At least three people have also died in the Galicia region of the northwest Spain, where authorities have evacuated thousands of people. Spanish Prime Minister Mariano Rajoy says he's going to visit the area, which is his native region. He tweeted: "I'm heading to Galicia. Solidarity of all Spain and prompt coordination to combat the fire and assist people." Two people were killed when they were trapped by flames in a van in Chandebrito, northwestern Spain. Portuguese Civil Protection Agency spokeswoman Patricia Gaspar said 51 people were injured, 15 seriously, while an unconfirmed number of people are missing. Gaspar said the fires are likely to keep going due to unseasonably high temperatures of more than 30C (86F), although cooler, wetter weather is on the way.